Led by senior linebacker John Fields (49), St. John's looks to be as strong as ever on defense this year. St. John's has been known for it's no-huddle "Blur" offense the past few years, run to perfection by multi-year starting quarterbacks Andrew Smiley and Tim Cassidy. This year, however, the Pioneers replace nine starters on offense, including a new signal caller. That means St. John's could be a (gasp) defensive team in 2016, and that's not by default. Led by a trio of talented senior in the front seven, and a massively talented junior class, the Pioneers are poised to be one of the best defensive teams in Central Mass. But oh yeah, they also have the pieces to again be explosive on offense. I caught first-look at St. John's Saturday in their annual scrimmage against Brockton. For a full write-up of that scrimmage, head over to ESPN Boston. For more on what to expect from the Pioneers this year, continue below. Few teams in the region, or state, will be able to match the Pioneers' experience and physicality up front. Senior linebacker John Fields is a sideline-to-sideline play maker, who will be starting at middle linebacker while junior Isaiah Keegan recovers from an injury. At outside linebacker, fellow junior Liam Doran has the look of a great off tackle run and flat defender. The defensive line should be a strength as well, as St. John's welcomes back senior end Tom Feraco, who missed 2015 with a knee injury. Feraco is back to full strength, and more than one person on the St. John's sideline described him as a "freak" during the Pioneers' scrimmage with Brockton. On the other side of the line, Flynn McGilvray is a solid edge setting end, while junior tackles Ryan Kelley and Aidan Flaherty can each defend the run, and push the pocket up the middle. Another player to keep an eye on is junior Hunter Gorgas. The 6-foot-5 junior will play both end and tackle, and looks like a natural pass rusher. He's got the kind of long arms coaches love in a defensive end, and came away with a huge sack on a third down during Saturday's scrimmage. Gorgas will also work as a big-bodied receiver on offense. The secondary is still working some things out, but junior Owen Ryan is in the midst of a successful transition from cornerback to safety. The speedy junior covers a ton of ground while roaming, and has the versatility to come up and play coverage as well. Add in promising junior Andrew DelBrocco, who can play both safety and corner, and St. John's should be fine on the back end. As I mentioned earlier, so much that St. John's has done the past few years has started with a talented quarterback running coach John Andreoli's up-tempo offense. This year the Pioneers will turn to junior Steve Bucciaglia. After starting for the JV last year, Bucciaglia feels comfortable running the "Blur," and showed off a quick release, and the ability to throw on the run Saturday. Coach Andreoli also like his young quarterback's presence in the huddle, and attention to detail on little things like carrying out fakes and going through his progressions. As with any young quarterback, there were some ups and downs for Bucciaglia against Brockton, but you can see the leadership and physical tools for him to be a good one. Add in the fact that he seems to be able to make plays on the fly, and looked unflappable, even as Brockton started to blitz, and there are certainly reasons for optimism at quarterback. St. John's always seems to have a bevy of receivers with solid hands who can make plays, and this year's headliner should be Nick Pallotta. The senior led St. John's with 35 receptions and four touchdown catches a year ago, and was as good a downfield receiver as there was in the region. The Pioneers will also look to get their screen game going again in 2016, something they struggled with against Brockton. That screen game will likely get a boost when junior speedster Josh Shrestha returns from injury. In the backfield, St. John's has plenty of options. The junior trio of Peter Oliver, Michael Bernard and Danny Byers should power the St. John's ground game. Each provides a little something different, but combined with Bucciaglia's athleticism, the St. John's zone read should again be one of the toughest plays to stop in Massachusetts, especially when defenders are struggling to catch their breath against the Pioneer no-hudle. I mentioned this in my scrimmage story for ESPN, but St. John's has a really impressive offensive line. Junior guard Federico Ernst looks every bit the 300 lbs he's listed at, and the Pioneers also boast a pair of tackles that each stand over 6-foot-3 and weight over 260 lbs in junior LT Neal Nasuti, and senior RT Sean Ford. Senior center Matt Petry and junior guard Charlie Michaelides are each over 250 lbs, but more impressively, can both really move. St. John's has a rare combination of size, strength and speed along its offensive line. While the offense is largely being rebuilt, look for this group up front to carry St. John's early. St. John's always plays a brutal schedule, and will once again come in as a favorite in the newly realigned Division 2 Central. The Pioneers will share that distinction with both rival Leominster and newcomer Shepherd Hill. As for that brutal schedule, the Pioneers open up at home on Saturday, September 10th against Catholic Memorial, looking to avenge an early season defeat from last year. They then jump into D2 Central play at Shepherd Hill the next week, then travel to Connecticut to face Xavier, a squad they edged at home in 2015. The following week brings a trip to Bolton to face reigning D2 state champion Nashoba, before the Pioneers return home to face cross-town rival Shrewsbury. St. John's then hosts divisional foe Wachusett and arch nemesis Leominster, before closing the season out at Algonquin. The Pioneers will again face St. Peter-Marian on Thanksgiving. Looking at that bear of a schedule, a few things pop out. The first is the Pioneers' three-game road trip in September that will take them to Shepherd Hill, Xavier and Nashoba. That's brutal. As always, the St. John's-Leominster game is the one to circle, and non-division games against Catholic Memorial and Xavier will give us early indications of where this team is offensively. 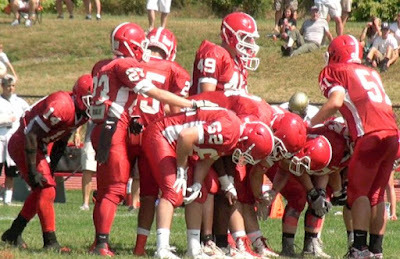 With the way their offensive line and defense are coming together, you have to believe St. John's will be able to overcome some experience deficiencies on offense early on, and Week 2 at Shepherd Hill will show us just how tough these two teams are. Expect the Pioneers to again contend for a D2 Central title, and boy is that division going to be fun to watch.